How to save BMP images as RAW in batches? You are here: CoolUtils > Total Image Converter > How to save BMP images as RAW in batches? BMP format is rather limited in editing and graphic adjustments. It is not suitable to the most of design projects, and users often have to convert BMP images to other formats. 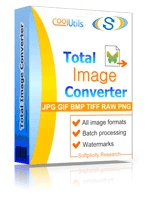 Total Image Converter features more than 15 formats for conversion, including BMP to RAW. This mode allows turning BMP raster image to raw graphic data that can be further adapted for any needs. With Total Image Converter you will do this quickly, even not having special skills. The data format can be binary, ascii with decimal values or ascii with hexadecimal values. All these settings are available in 'RAW format' tab in settings wizard of RAW converter. It appears after you specify BMP source files and click on RAW icon in the top format bar. When you convert a few images, the parameters you set in the wizard will be used for all files. No matter if they are different in size, colors or other properties. 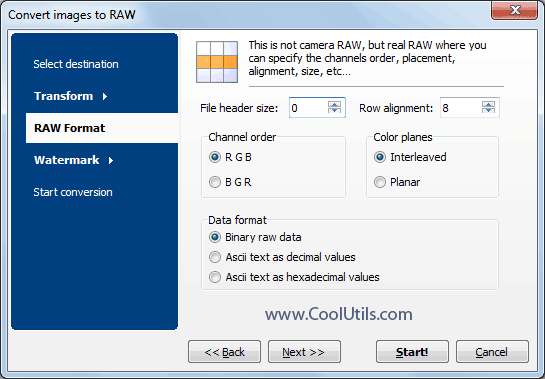 In the result RAW copy will have unite formatting, adjusted in conversion wizard. Test export to RAW format for free during 30 days, get trial version here!